Animation courses in India and multimedia are fast becoming sought after professional courses in India. Animation or computer animation is an art of creating animated images using computer graphics. Computer animation is used extensively across various domains nowadays - film, television, video games and even industrial machines use animation. 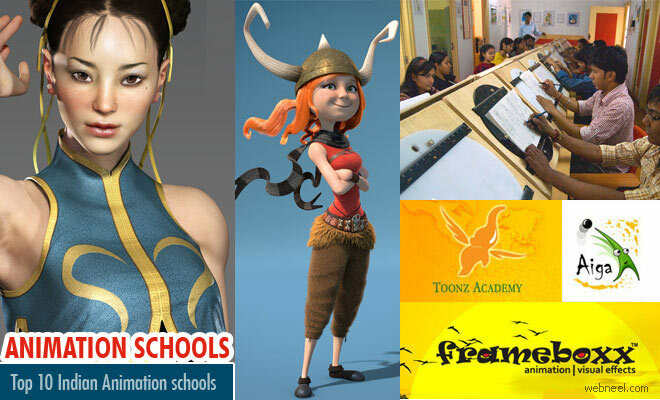 These top Animation colleges in India will help in honing the skills of students who are interested in the field of animation. There are plenty of animation courses in India, so we have listed the Top 10 Animation Colleges and schools for aspiring students. About Academy : [Best Animation School] MAAC is the high-end 3D animation & VFX education brand of Aptech. Through its wide network of centres, MAAC has prepared thousands of students for careers in animation, VFX, filmmaking, gaming, web, graphics design, and media & entertainment. The Academy provides quality education through career-oriented courses, leading to top-notch job placements. The Academy also has varies other short term and long term programs in Animation, Multimedia and Gaming. About Centre : The Animation program in IDC strives to create people with expertise who will eventually emerge as leaders to influence the future of Animation. IDC expects the students to assume direct responsibility for nearly all aspects of the film making process - from concept to drawing, shooting, camera etc. Its the one of best animation school in india. About Institute : Vellore Institute of Technology originally started as Vellore Engineering College has taken a giant leep in its growth to become a Deemed University. VIT provides quality education on par with International standards. The multimedia degree offered in VIT includes state-of-the-art experience in graphics and animation in mixed media. VIT with it's highest number of placements offered to its students has entered Limca book of records for 7 years. VIT is third among the top 30 research-oriented institutes. About Institute : As a pioneering Institution in the country, National Institute of Design beleives in combination of design theory and practice, knowledge and skill. With increasing demand for native ideas in the growing animation industry NID generates talented animators, content creators and mentors. The students are exposed to Chitrakatha; a biennial student international animation festival which gives a chance for the students to interact with global animation experts. About College : Amity University offers comprehensive technical programs which compete with the emerging needs of the industry. Amity University believes in the integral development of students and gives importance to personality development. The university provides best learning environment on par with global education. About College : Inamdar College of Visual Effects imparts multi-disciplinary education in fine arts and digital media. The college is part of popular Azman Campus, one of the oldest in Maharastra. The college is autonomous and is affiliated with The Yashwantrao Chavan Maharashtra Open University for Animation and Media Courses. Apart from this the University offers various Diploma and Certificate courses in Animation and Graphics. About Institute : MIT Institute of Design offers programs on Graphic design, Animation, Game deigning and Film making. The Institute has received 'best university campus' award at the 10th National Education Excellence Awards 2017. The curriculam is designed in such a way to catch up with the ever growing animation and graphic industry on par with international standards. About Academy : Asian Academy of Film and Television is situated in the heart of 100 acre wide Noida Film City. The academy belongs to the leading entrtainment and media conglomerate - Marwah Studios. So far as many as 17000 professionals were trained in the academy from the time of inception in 1993. The is a pioneer in the industry and offers globally accepted standards in education. Academy also offers varies Master Degree, Diploma and Short term courses in Animation, Multimedia and Gaming. About University :World University of Design was established at Rajiv Gandhi Education City, Soniapet in Haryana with the motive of nurturing the fast growing industry of Design and Animation. WUD believes in promoting the job opportunities for its students through International collaborations. It has signed MoU's with international institutions in UK, Cananda and France. Moreover WUD is a full member of Cumulus, International Association of Universities & Colleges of art, design & media. About College : NSHM school of Media&Design is one of the largest media school in Kolkotta in number of students and in infra structure. The latest technological advancement are found in the concerned departments to provide industry atmosphere to the students. NSHM ensures regular industry interaction for the students to make them ready to face the industry needs. NSHM is affiliated to Maulana Abul Kalam Azhad University of Technology and is approved by AICTE. About College : IIFA involves innovative specialisation based training which is crafting and polishing the skills of the students. The students of IIFA after completing their Diploma, Master Diploma and Degree courses get job opportunity through LANCASTER international placement cell. The motive of the institute is to create an opportunity for the students to qualify for the global market needs. The Institute also offers various Diploma, Certificate and Masters programs in Animation and Graphics.